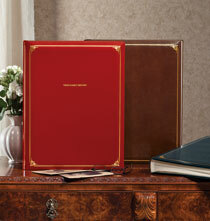 Are you looking for an oversized album that brings a touch of class to your scrapbook project? Well, we have just what you desire. 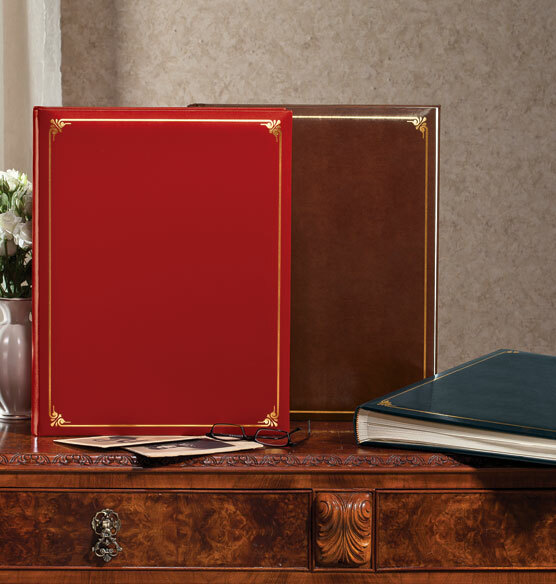 This classic style leather oversized scrapbook has enough space for preserving your largest memories. 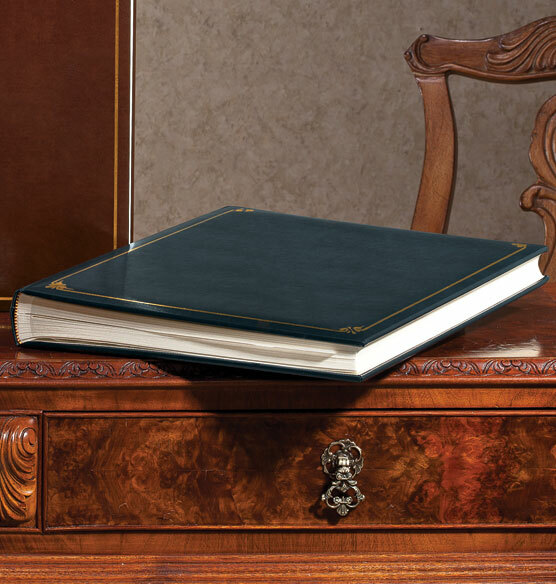 The cover is crafted of quality bonded leather and it feels luxurious to the touch. Gold tooled borders on the front provide another touch of class, making this a scrapbook you can proudly display on a coffee table for all to see. Use it to showcase family vacations, weddings, romantic moments, school events and any other memories you wish to enhance with a touch of creativity. Inside are 50 generously-sized ivory pages with interleaving tissue. Meticulously crafted of the finest Italian paper, this leather scrapbook is worthy of your priceless memories. This scrapbook will stand the test of time. This scrapbook is to be a Christmas present for my husband. It is to be a "this is your live" from childhood to the present. Big job to do and keep a secret. I kneed this large to hold his Dental Diploma. I prefer bound pages and I need a large size. Needed a scrapbook the same size as what I used to order. This was the closest option. I have two other scrapbooks and use them for photos of special trips. This one will hold family tree photos. The other books were made extremely well. My mom made a scrapbook for me years ago with a product from Exposures. I am hoping that the quality will be as good as it was then. Going to assemble concert posters, photographs and other memorabilia to give my man on his birthday. This is the perfect size to accommodate all of these items and will be pretty enough to display on the coffee table. I enjoy having the tissue paper in between the pages and they protect my pictures very well plus the size is ideal for larger pictures/newspaper articles. Size and quality met my requirements to protect my historic family documents. Having a very hard time finding oversize scrapbooks (12 X 15). Exposures used to sell one I really liked but the quality just went down and down on it, then it disappeared. Now the few I can find are postbound or 4-ring instead of bound and rather than the interleaving pages I prefer, have plastic page protectors. So it was this or nothing. I love scrapbooks that have interleaves-they are much nicer than photo albums with plastic sleeves. It looks nice and i like the size. I've ordered 6 of these in the past and use them for both scrapbooks and photo alblums. They are great because they hold so many items. because I have one already and need another and the size is perfect for all my photos and memorabilia. We have accumulated several of these over the years and while they are quite heavy when full of photos they are great for holding lots of pictures per page. Our family loves looking through them to reminisce. Good quality! We have a new baby in the family. Oversized scrapbooks are no longer available in stores; military awards and some photographs from yesteryear were larger than standard size paper today. It would be nicer though if scrapbook sheets were post-bound and removable so something found later could be added chronologically, and because some items, ie. patches, have a thickness. I have purchased over 16 albums from Exposures. I love the scrapbook format as pictures vary in size and also one can put cards or notes in the album as well as photos. The quality has always been excellent and house my most prized possessions. I am going to put all of the ticket stubs and miscellaneous stuff all in one place! I've purchased three of these oversized scrapbooks before--one for a graduation and two for grandchildren's memories (baby to 1st birthdays). I have another grandchild and want to do the same for her. Beautiful albums--the very best keepsakes. because of the size. It is hard to find this size. We use this scrapbook to keep newspaper clippings and other news for keepsake for company use. It is hard to find oversized high quality leather albums for making lots of albums over time with photos and clippings, etc.. This album fits the bill. what size are the pages? can I have it without interleaving? BEST ANSWER: Thank you for your question. The usable page space measures 13 3/8" wide x 17 7/8" high. This item is not available without the interlocking tissue. We hope this information will be of help to you. Is this oversized scrapbook bound or is it looseleaf? BEST ANSWER: It's not looseleaf but it's also not bound. It's held together with screws so you can add more pages. The last one I purchased was bound. Not looseleaf. It also has velum sheets over each page. It is bound. It has a good number of pages, but you cannot add any additional pages to it. It's bound, with acid-free tissue separating the scrapbook pages. This is a beautiful "bound" oversized scrapbook. is it possible to add pages to the leather oversized scapbook?? Also, what are the dimensions of the album? BEST ANSWER: Thank you for your question. Unfortunately no, we are not able to add pages to the over sized scrapbook because it is a bound album. The size of the album is 14 3/4" wide x 18 1/2" high x 3" deep. We hope this information will be of help to you.